This is a colossal one. code666 has been doing some pretty solid stuff in the realm of heavy music for a while now but this is perhaps the first time that something of theirs has made its way into my hands and really blown me away. 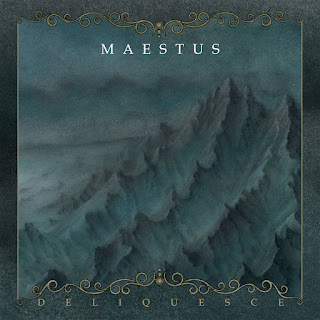 With a sound reminiscent of Evoken the doom metal masters of Maestus unveil something truly special on Deliquesce a record full of bombastic compositions and a stunning interplay between dark and light. It makes for some truly compelling listening from a band who can't help but to impress. Deliquesce is exciting for a whole mess of reasons, though I think that the delightful keyboard padding is one of the most important and sure to be underrated elements of this band. The eerie way that the synths create powerful added layers to this group are mesmerizing. Include that these guys are not only top notch songwriters but musicians who understand how to really tug at the heartstrings with their every melody and you find yourself presented with a group who could rival their peers in bands like Un. The band is aware of their own inherent melodrama too, and that's part of what makes for such compelling listening. It's a rare and esoteric journey through a darker side of the human condition. Maestus have crafted something that you can really spend time with here and something that really encourages the listener to sink their teeth into it and fall in love. This is an album that lives and breathes metal magic but also speaks to a level of torment that is almost heartbreaking. Deliquesce is the next step for this Eugene, Oregon tribe of doom masters and I think we are going to be hearing a lot from them in the next few years as they continue to refine, evolve and adapt their sound for bold new vistas.